Disassembling the shocks for cleanup and painting revealed that one shock had a 1⁄2 inch long dead zone on the compression / rebound stroke. The dead zone went away when pumped in the upside down position meaning it either lost some oil or air got in. Both shocks showed no oil leakage, so I figured it must be air in the cylinder. All that's needed is to open the cap and add some oil to fill the air space. My attempt to make a cap removal tool didn't work; the cap wouldn't budge even when using a blunt punch and hammer. That's when the shock started looking like junk and modern replacements were next. Air getting past seals is a situation I experienced with my racing dirt bike forks back when they had wooden wheels. So if air can get into the shock through the seal maybe thin oil could do the same. 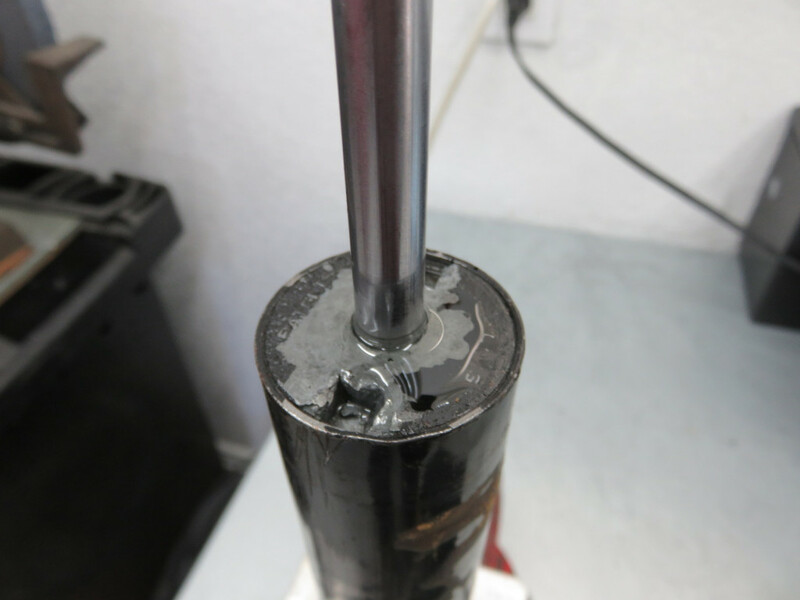 To see if that would work; the rod was pushed down just to the point of resistance and then with a puddle of 3-in-One oil around the shaft, I slowly pulled the shaft up hoping that the suction could pull in the oil. Much to my surprise, after several pumps and more oil puddles the dead zone gradually went away. It didn't take much oil to fill the air space so it looks like a little air in the shock cylinder can significantly affect the damping action. To make sure this wasn't a fluke I wiped the shock top and rod and pumped some more looking for oil being pushed out but it stayed dry. After a few days and retesting, no dead zone. While the other shock seemed OK it got the oil treatment too. I used multi-purpose 3-in-One oil (white bottle) since it has low viscosity, has a nice smell and available at Home Depot. 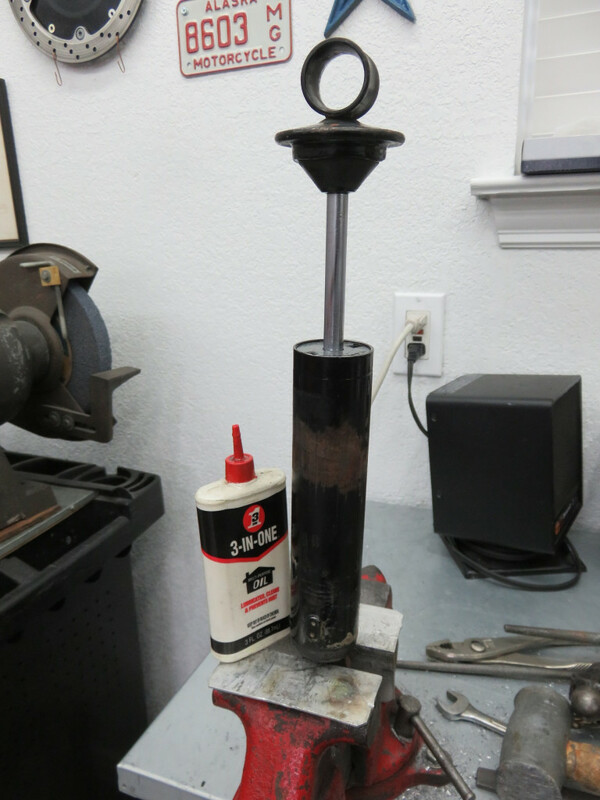 Next up is cleaning, painting and re-assembly using the homemade shock spring compressor tool.